Brent Musburger has stayed active since his departure from the ESPN/ABC broadcasting booth in January 2017, becoming the public face of the Vegas Stats and Information Network (VSiN), the sports-gambling-centric media outfit created by his brother and nephew. Its home base is Las Vegas, naturally, which in 2020 will become the home city of the Oakland Raiders. And so Tuesday’s news didn’t exactly come as a shock, even if Musburger is getting along in years at the age of 79: As confirmed by Gilbert Manzano of the Las Vegas Review-Journal, the broadcasting legend will become the new radio play-by-play voice of the Raiders, starting this season. He’ll have a three-year deal, with the final year coming in the Raiders’ first season in Las Vegas. Musburger will replace Greg Papa, the Raiders’ radio voice since 1993 who was well known for his “TOUCHDOWNNNNN RRRRRAIIIIDERRRRS” call on the team’s scoring plays. Papa was quite close with former Raiders owner Al Davis until the latter’s death in 2011, but less so with Davis’s son, Mark, who now runs the team. In January 2015, Papa criticized the Raiders for interviewing Mike Shanahan about a possible return to the team as its head coach. Shanahan and Al Davis had a legendary feud following the former’s stint as the team’s coach in 1988 and ’89. 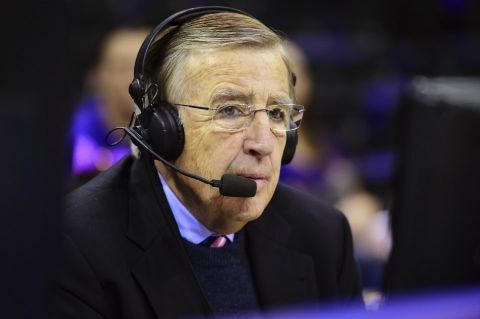 Congrats to Musburger, he was always someone i liked in the Broadcast Booth. Some do not like him and he has had a rough ride some of the time but he still manages to get work where many more fell by the wayside.